This acrylic painting is part of the Dance series on paper, created early 2016. Inspired by watching many dance videos this piece was inspired by two dances which were then fused together. It has a slight 'graffiti' element with dots and dashes of pure colour shooting through the diagonals. I love the way that rich colours such as fluorescent pinks blend perfectly with blue greens in the background. A lot of water and a steady nerve combines together to create these pieces which are done in a spontaneous free way. Another of the Dance series on paper, this unique original, acrylic painting has a darker more abstract feel. 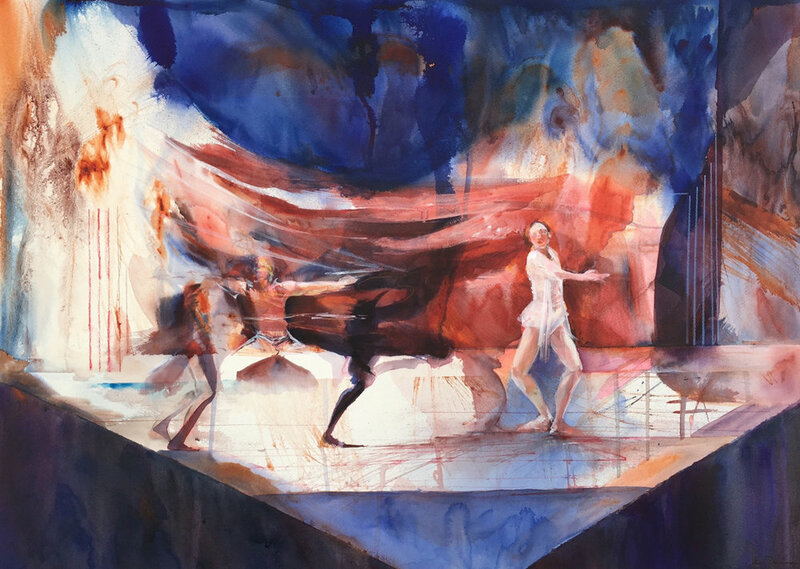 It is inspired by the choreographer Sol Leon and it has a real stage feel with strong lighting, this series really focuses on giving figures a 'setting' inspired by my own intuition. Stop Motion is one of the more abstract pieces depicting dancers in motion which has been the focus for over 6 years now. Turning Point has soft brown pinks offset with light greys and some very understated shimmer within the paint. The way the light worked out in the painting was a real surprise for me and totally unexpected. This Dance series on paper was a real turning point in itself. I started to work with fluid colour on wet paper letting a lot of the colour and flow do its own thing. Working without brush and allowing colours to mix freely gives a beautiful glow to the pieces. This method of working is usually associated with watercolour. The result using acrylics is that you have a much more 'light fast and permanent' painting.